In the South West of the city of Edinburgh lies the refined and cultural area of Morningside. Morningside’s affluent residential element presents beautiful Victorian villas dotted throughout. with an eclectic collection of small traditional shops, schools and restaurants as well as other notable buildings of architectural interest. In short, Morningside has much to offer both its residents and visitors. 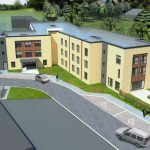 Morningside Manor… A purpose built care home to be registered with with nursing, equipped with 42 single room with shower en-suite facilities. Bringing you exciting internal design features and external spaces such as cinema & activities rooms, visitors cafe, multiple lounges which lead to our ground floor enclosed garden or our first floor roof top garden. Encompassing great public transport links, we also provide private parking for our visitors and staff. We are passionate this thoughtful care facility will marry well with our high quality care standards, providing a fabulous platform for our staff to ensure the residents feel at home. The family would like to thank you all for everything you did to make Norman’s life so comfortable. He felt at home in your care…. The atmosphere at Thorburn worked perfectly for us and to be honest, I am already missing my daily visits for afternoon tea. Congratulations on running such a fine establishment and thanks again to everyone involved in what amounts to some excellent teamwork.